There is no universally accepted definition of organic farming, but most consider it to be a specific production system that aims to avoid the use of synthetic and harmful pesticides, fertilizers, growth regulators, and livestock feed additives. USDA guidelines state that farmers use agricultural methods that preserve the environment and avoid synthetic farming and agricultural materials. Almost all organic farming systems rely on what some call alternative farming methods, such as crop rotation, mechanical cultivation, animal manures, green manure, and integrated pest management to maintain healthy soil, grow healthy plants, and control pests and weeds. Oddly enough, these alternative farming methods are older, from a historical perspective, than newer farming methods that include using pesticides and other synthetic farming applications. The National Organic Program (NOP), part of the United States Department of Agriculture (USDA), develops standards for organic farming, but these standards don't cover the maximum in sustainable farming practices. 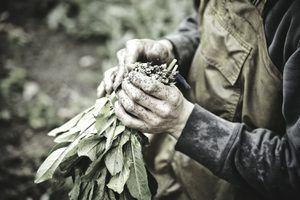 There is no consensus on whether or not sustainable practices are a necessary component of organic farming, further contributing to the lack of a universal definition. Enhancing the quality of life for farmers and society as a whole. Numerous U.S. states, regions, and local farmers have additional organic farming standards in place that exceed basic NOP standards. Additionally, other countries have established organic farming standards that differ from U.S. standards. Farmers can have their agricultural goods certified organic through the USDA. This involves submitting an application and required fees to a certifying agent accredited by the USDA. Land used to grow these goods cannot have been farmed with any prohibitive substances for at least three years, according to the USDA site. Assistance is available for farmers transitioning to organic. The USDA website lists different types of organic labels that can be used on food. Not including salt and water, 95 percent of a product's ingredients must be organic for a product to be labeled as "organic." If 100 percent of the ingredients are organic, a product can be labeled "100 percent organic." Labels also can indicate that a product is "made with organic" if at least 70 percent of the ingredients are organic. Any farmers marketing more than $5,000 worth of products annually must be certified to label their products organic. While those marketing less than $5,000 worth of products annually do not need to apply for certification, they still must abide by labeling standards. Could Your Hydroponics Greenhouse Be Certified Organic?